Destined to always be remembered as the jockey of Frankel. Tom Queally partnered the outstanding colt in all 14 of his races and the combination were never beaten. “I’ve a very easy job – all I do is steer,” he said after a second successive romp in the Sussex Stakes at Glorious Goodwood in 2012. There was a measure of truth, of course, although Frankel was not always an easy ride, especially in his early days when wanting to get on with things sooner than ideal. Queally got off to the most memorable start possible in the QIPCO British Champions Series by landing the first race, the 2011 QIPCO 2000 Guineas, in devastating fashion on Frankel. The pair subsequently annexed the St James’s Palace Stakes at Royal Ascot, the QIPCO Sussex Stakes at Glorious Goodwood, the Queen Elizabeth II Stakes, sponsored by QIPCO, at Ascot in 2011, followed in 2012 by the JLT Lockinge Stakes at Newbury, the Queen Anne Stakes at Royal Ascot, a second QIPCO Sussex Stakes, the Juddmonte International at York and the QIPCO Champion Stakes to seal a second QIPCO British Champions Day success. Queally won the inaugural Jockey of the QIPCO British Champions Series title in 2011, notching up six wins, and was third in the table with five winners in 2012, all courtesy of Frankel. 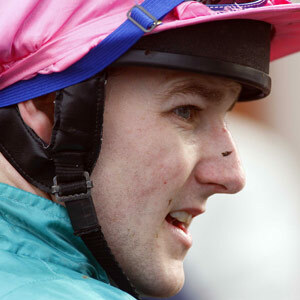 As a youngster, Queally was Ireland’s champion apprentice at the age of just 15. He moved to Britain in 2004 and became champion apprentice in the same year. His career had appeared to stall but in 2008 he effectively became Sir Henry Cecil’s first jockey and that changed everything. His major breakthrough came in 2009 with five Group 1 wins, including the $2 million Breeders’ Cup Filly & Mare Turf at Santa Anita Park, California, on Midday and the Champion Stakes at Newmarket on Twice Over, a race he won again on the same horse in 2010. Queally says much of his success can be attributed to the opportunity given him by Cecil. He began his professional career while still a schoolboy but his parents insisted he finish his education. He is the son of Declan Queally, who trains horses in County Waterford. After the death of Cecil, in June 2013, he continued to ride for Lady Cecil, but now rides as a freelance. Queally enjoyed his first Group 1 win since Frankel’s retirement when winning on The Tin Man on Champions Day four years later, and the same horse provided him with victory in the 2017 Diamond Jubilee Stakes at Royal Ascot.